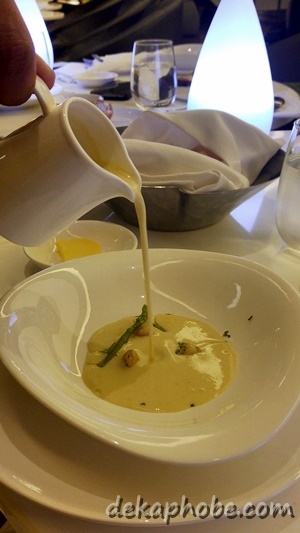 For soup, we were served Scallop & Champagne Veloute. The soup is an infusion of scallops and champagne, the flavors are mild and the champagne complemented the scallops well. For the main course, we had Lobster Ravioli and Beef Tenderloin. I was also served a glass of white wine along with these dishes. The Lobster Ravioli, served with pesto and saffron sauces, was a disappointment. The ravioli itself was tough, making it difficult to chew. However, the Beef Tenderloin was a complete opposite, with its really tender sliced beef on top of truffle mashed potatoes, lettuce and veal jus. I would love do have the beef tenderloin again. For dessert, we had a serving of 2 Ways of Churros. The churros is served with dark chocolate sauce and vanilla ice cream. The churros is extremely crispy on the outside but creamy and milky on the inside, a unique take on one of the popular desserts today. We were also served a special dessert by Gourmet Bar this summer: the Le Mont Gourmand (Php 999). Overall, I had a lovely dinner at Gourmet Bar by Novotel Manila. Most of the dishes we had were impressive and the service was excellent. I would love to go back and try more items on their menu, and probably have some drinks too. Thanks to Novotel Manila Araneta Center and Zomato Philippines for having us.